This is my favorite topic of all. There is just so much that goes into this, that I can’t possibly fit it all into one blog post, so I will be creating a series that will help you understand all the in’s and out’s of website design for your wellness website. Whether you decide to handle this yourself, or outsource it to someone you trust, you’ll know what to expect. I build in WordPress. This, in my opinion, is the best Content Management Solution out there. It powers almost 30% of the internet. Yeah, that surprised me too, last I checked, it was 20-ish%? So 30% of the internet means that about 1 in 3 websites are managed by WordPress (and that number keeps growing). Companies that have used this CMS include TechCrunch, The New Yorker, BBC America, Bloomberg Professional, The Official Star Wars Blog (a personal fav), Sony Music, & MTV News. There’s more, but I’ll spare you the extensive list. A close second is Squarespace. It’s easy to use and set up, and there are plenty of designers that use this platform to create super simple, quick and easy websites. It’s worth a look through if you’re looking to DIY! You’ll Need to Purchase Your Domain, and Set Up Hosting in Order To Get Started. This is easier than it sounds. There are so many companies that do hosting and will also sell you your domain. My favorite trusted hosts (and domain providers) are Dreamhost, and SiteGround. The two vital parts of having a website are the hosting and your domain, so understanding each is important. Hosting is where the files for your website get stored. Each website is a series of files. The content in these files is what tells your website what to look like and what to do when something gets clicked. It’s similar to if you were to save a document to a folder on your computer. The folder saves your document so that you can open it up later to view it again. For your hosting, instead of the folder being on your home computer, it’s stored in a computer provided by your website host. These folders and files are available 24/7, for anyone to access any time. Your host will usually provide you with a control panel or administration area, where you can manage your account. There are a whole host of tasks you can accomplish through your control panel (or sometimes referred to as a cPanel). Hosting can be purchased for anywhere from around $4/ month, all the way up to well in the hundreds of dollars. For your wellness website, you should be able to find quality hosting solutions for between $8 and $20 per month. This depends on your number of visitors and the size of your website. Most hosts will allow you to upgrade and downgrade freely based on your requirements. Domains are the letters and numbers you type into your internet browser, usually followed by a “.com”, “.net” or “.org”. 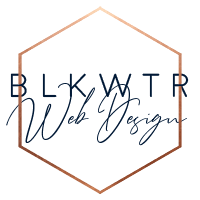 The domain of the website you’re viewing right now is blkwtrdesign.com. Registering your domain through your provider makes it your property, and no one else can use it for their business. Scooping up your domain for your wellness website is vital to your business. Make sure it’s a memorable one, and easy for people to remember, when they type it in when they get back to a computer. Domains come in a range of prices as well. They could be included in your hosting purchase, depending on your provider of choice. There are squatters who will sit on domains because they think they’ll sell them one day for thousands of dollars. This normally isn’t an issue, but you may come across it one day in your internet travels. Once that is all set up, you’ll need to install WordPress!